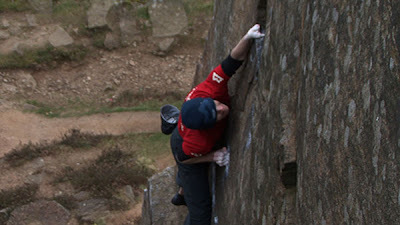 Earlier this year I headed down to The Peak to film Kev Shields climbing on the grit. This was Kev’s first grit trip, so it was great fun showing him around the crags and pointing out lines for him to look at. 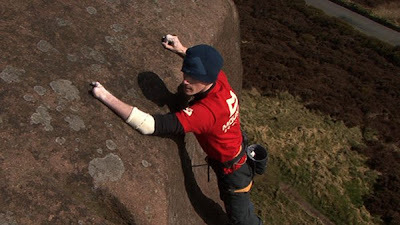 If you’ve not seen Kev in action before, check out the clip of the month on our homepage from Committed Vol1. 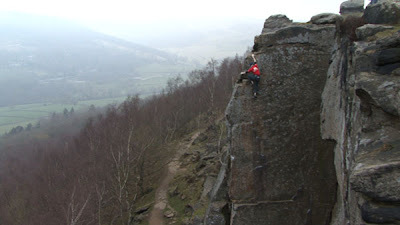 While at Ramshaw Rocks Kev spied the nice looking line ‘Traveller in Time’ E4 6a. Kev was almost stopped by a long reach out left at half height. As most of Kev’s left hand is missing it makes moves like this almost impossible, but after inventive use of a high toe hook with his right foot Kev made it to the top moves. The next day at Froggat Kev made a fine solo accent of the classic Brown’s Eliminate E2. I always find climbing with Kev inspirational; it forces me to examine my own self imposed limitations and makes me think what I could achieve if tried has hard as Kev does.